you can also benefit from every option of Prestashop "Customer loyalty and rewards" Module that is not more available for Prestashop 1.7: choose a ratio, a validity period of a point, a minimum amount, order's status for awarding and canceling loyalty points; categories for using created vouchers..
this module is compatible with the old Prestashop module and allows you to keep points that I had in your shop. Fixed Amount: The amount of points that you enter will be allocated instead of the default amount. Example: Product at 100 €, with a ratio 10 € = 1 point, the customer should get 10 points with the purchase of that product. You can set up 50 points for the product, which will be used in place of the present 10 points. Multiplier: the default point amount per product can be multiplied by a number you specify. Example: Product at 100 €, with a ratio 10 € = 1 point, the customer should get 10 points. 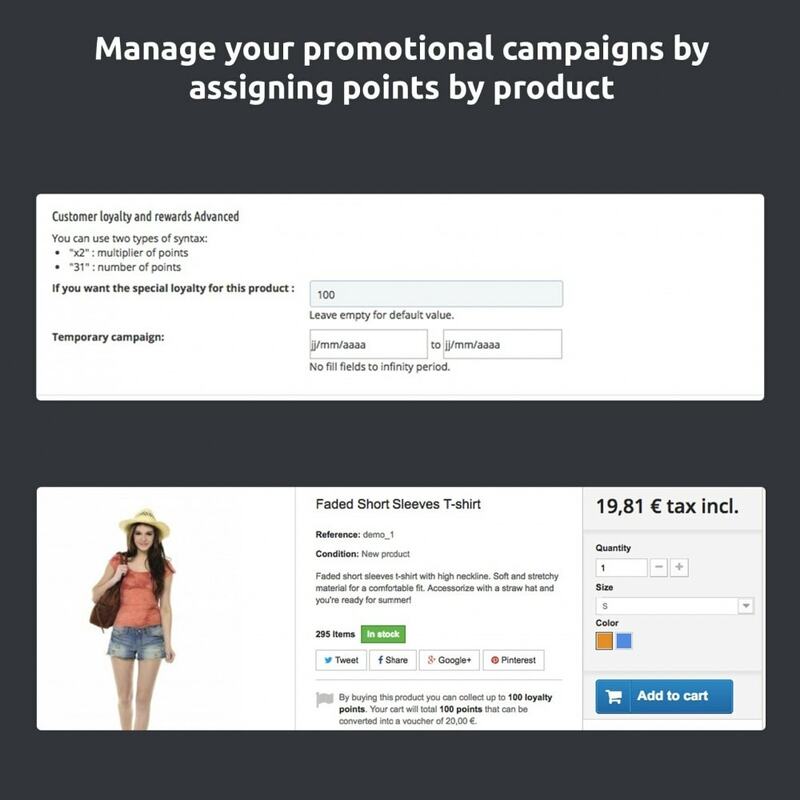 You can set x2 for that specific product, and the customer will get 20 points after purchasing. 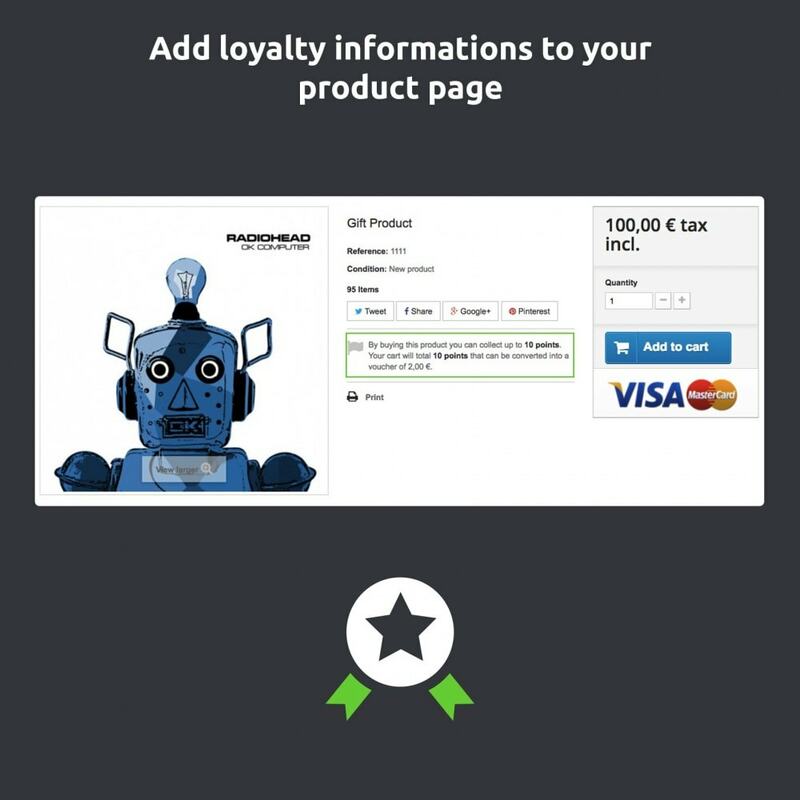 The information block located next to the add to cart button takes into account the specific loyalty points. 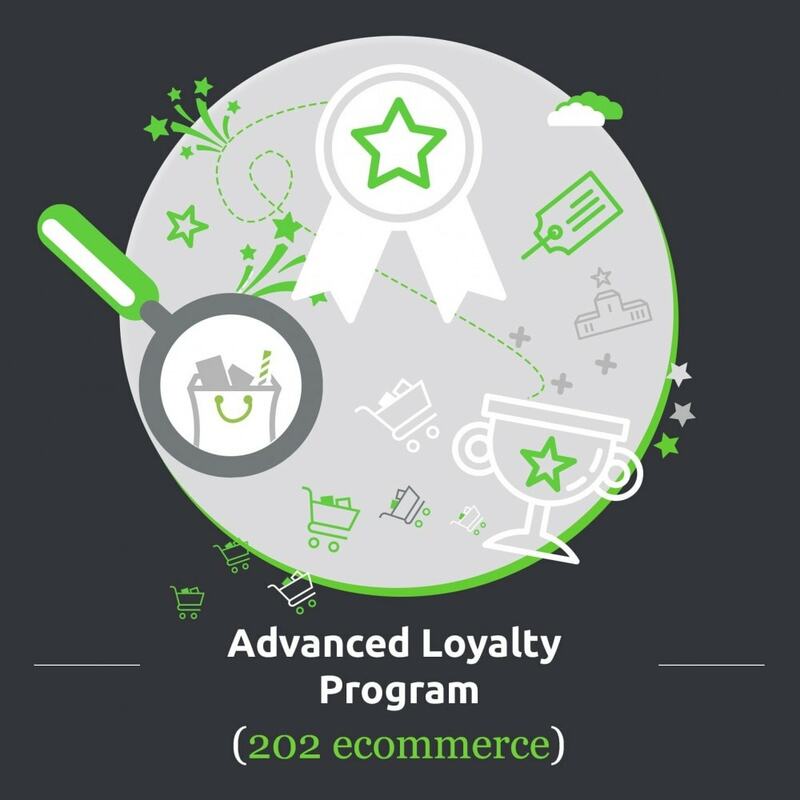 In addition, the module "Advanced loyalty program" allows you to view an organized list of customers in ascending/descending order according to amount of points. 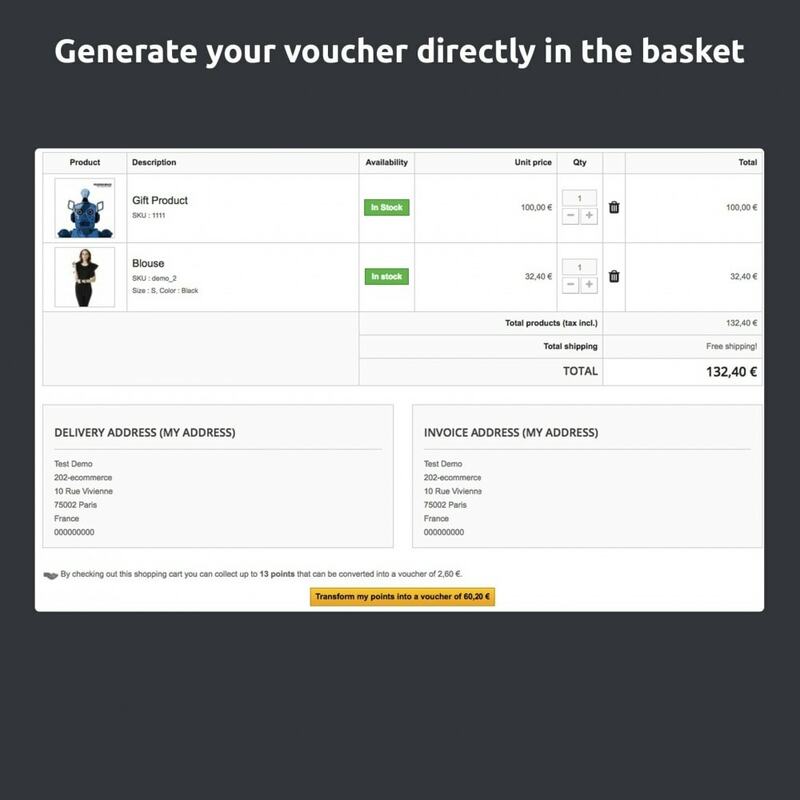 Convert their loyalty points into the shopping cart: The module allows your customers to directly convert their points into the shopping cart and get a voucher for their current order. If the cart amount is superior to the voucher used, a new one is created with the differential value. 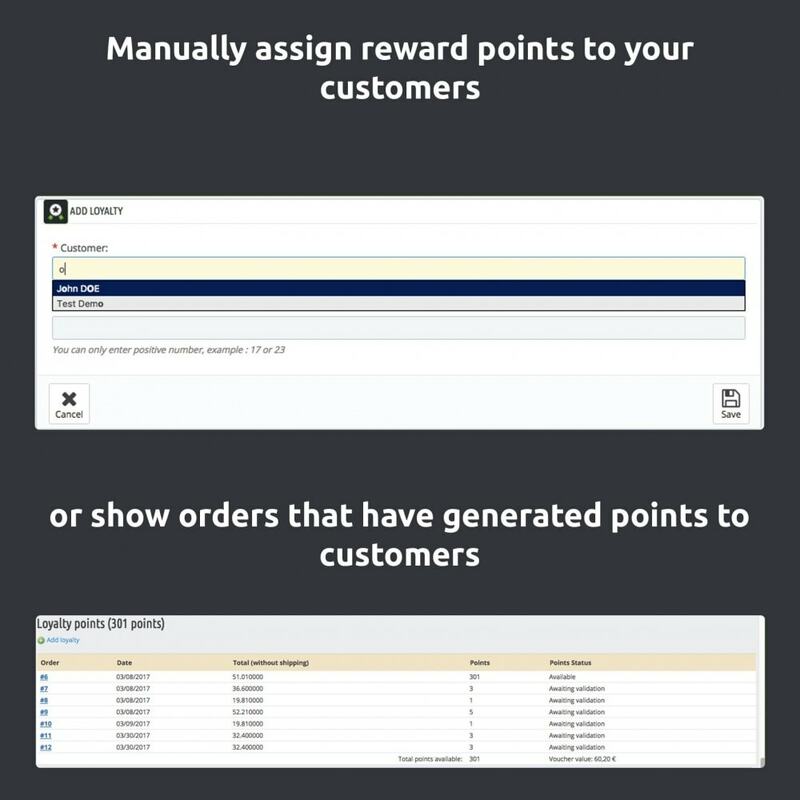 Finally, it is possible to manually adjust points of specific customers: you choose a customer and then enter the desired number of points. You can also edit or delete already existing points. 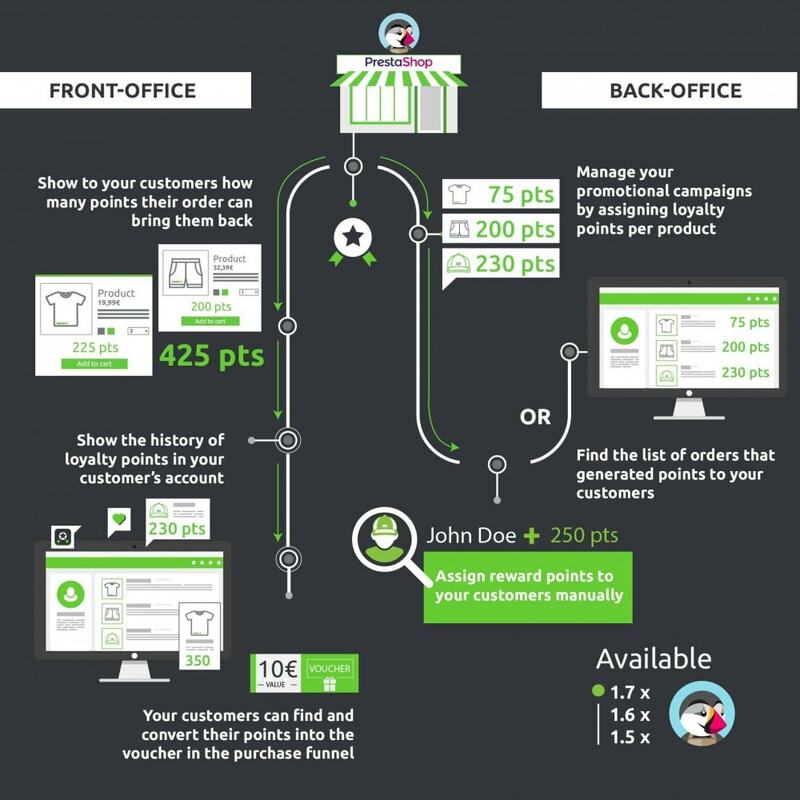 The points are immediately added to the customer’s account. You can also translate or change texts quickly via Prestashop translations. Other modules 202-ecommerce: We suggest you the “Automatically Add Product / Insurance / Gift To Cart” module for adding automatically a gift to your customer! We are a web agency specialized in e-commerce web sites and Prestashop add-ons (for example, Paypal, eBay modules). Composed of passionate web professionals in online sales, we are working alongside e-businessmen enlivened by the same wish to always sell more. 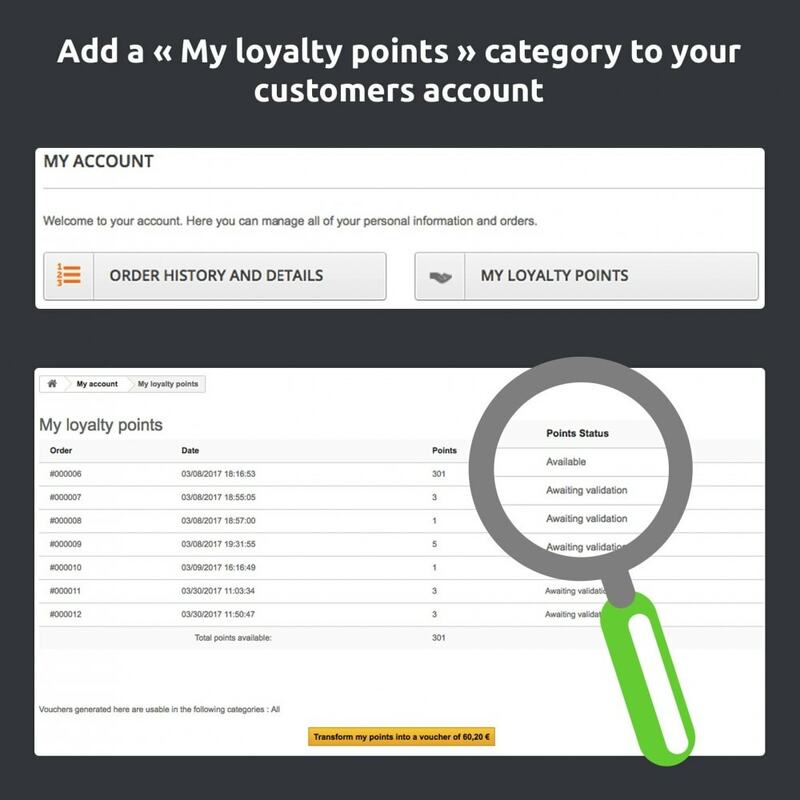 the history of loyalty points in the user account. Do not hesitate to contact our support team if you have any questions. 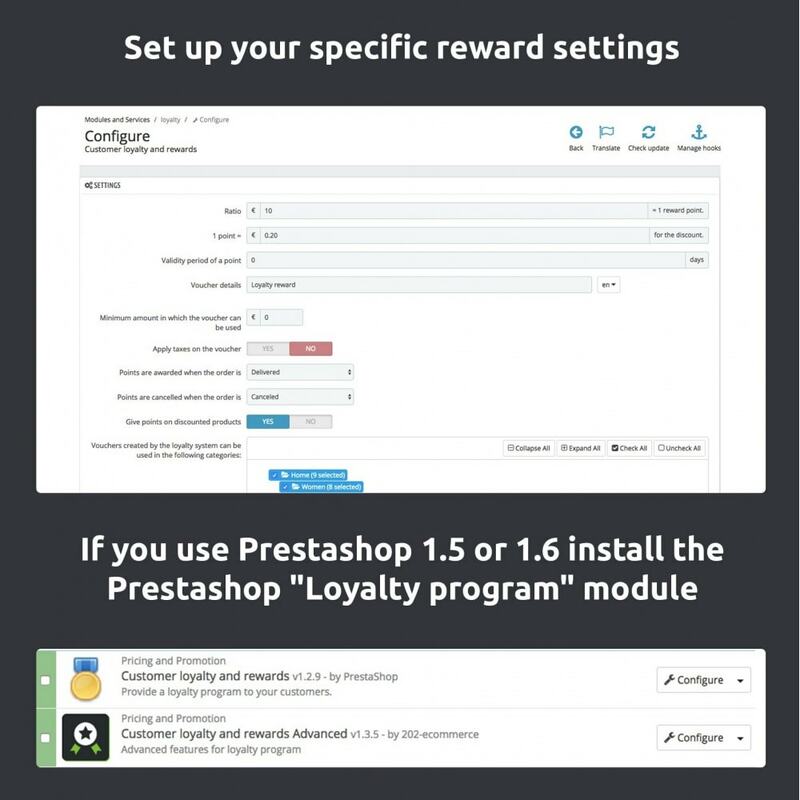 If you use the Prestashop 1.5 - 1.6 pay attention that the module works with the native and free PrestaShop module, "Loyalty Program". 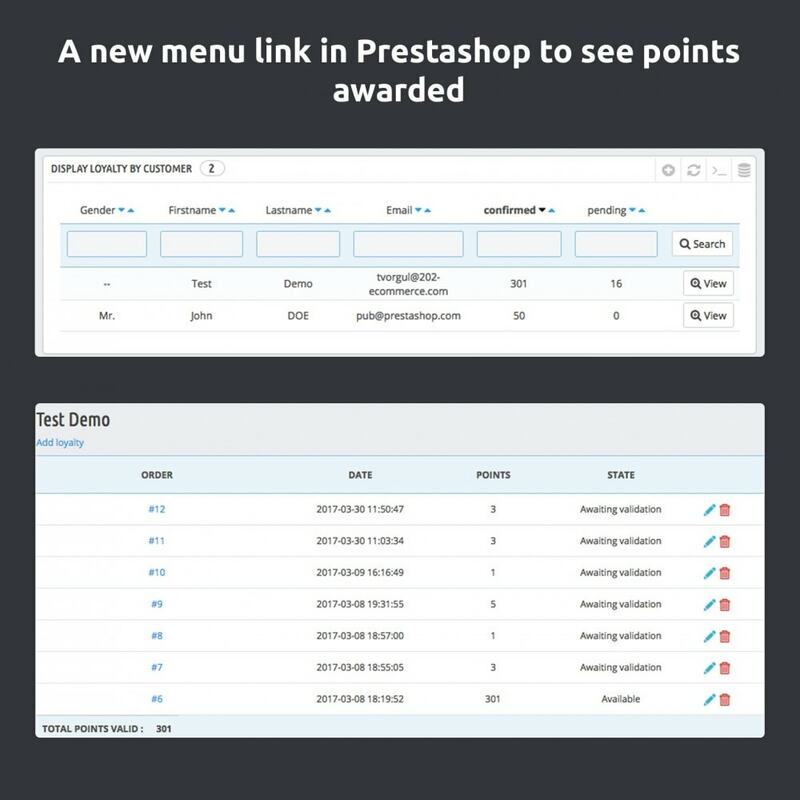 For Prestashop 1.7 you do not need to install the native module. This module allows you to create your custom fields and to show them on Product, Category or Order pages in Back Office and Front Office. 4 types of fields are available : text, text area, image, video.